Today is my youngest daughter’s 14th birthday. We are not having a birthday pary. She doesn’t even want us to sing to her! I suppose she is now officially a teen ager. One tradition that we do have for their birthdays that she still wants to stick to is the one that involves food. Every year on their birthdays, they get to choose the meal. On previous years, when it came time to my youngest daughter’s birthday, everyone else in the house will start dreading the day because they know what is coming. SPAGHETTI! No, my spaghetti isn’t that awful! It’s just that it’s the Clone’s favorite meal. She requests it at least once a month but especially on her birthday because she knows she’ll definitely have her wish granted. This year though, you can tell someone is getting older because spaghetti did not even come into play. 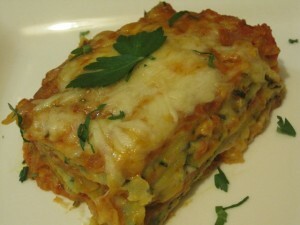 What did come into play though is spaghetti’s more sophisticated cousin, LASAGNA! This year, she requested Spinach Lasagna, roast beef with lots of gravy and collard greens. Yes, she specified COLLARDS because she was tired of malabar spinach which is the only green that we had a lot of from our garden this year. She didn’t want anymore spinach, well except for the small amount used in her lasagna, so off to the market we went to buy collards. Her main request of spinach lasagna, we discovered a year or so ago when I participated on a blogging carnival called Daring Kitchen where food bloggers were encouraged to try challenging recipes that they would normally not cook in their kitchen. For this particular challenge, it was making your own pasta, and spinach pasta at that! The recipe looks a bit daunting, but I assure you, by the time you’ve made this dish a couple of times, it really does get a lot easier. This time around, I was thankful for the girl’s penchant to play with dough. I still haven’t got a pasta maker so was I glad when she asked if she could roll out the pasta! She did a great job, too, even managing to roll out wide sheets that almost covered the whole pan in one whole swoop! Looks yummy….can’t wait until my girls can do something useful in the kitchen 😉 Happy, happy birthday again to Clone! Looks really delicious! You should have added the recipe’s for this as well! Oh, and belated happy birthday to your daughter!! @jlem1125 Thanks for reminding me! I just added the link to the photo. It will now take you to the recipe. I’m really glad you posted the pasta recipe. Just the other day I was thinking about making my own but didn’t find my old recipe for it.